Home » Who is the PBC? Recognizing the need for professional management of public construction projects, Mayor Richard J. Daley in 1956 formed the Public Building Commission of Chicago to oversee and help ensure quality facilities, an important goal that continues to lie at the heart of the organization. Today, PBC Chairman Mayor Rahm Emanuel is joined on the board by 10 other business and civic leaders whose dedication to the city and its communities has led them to volunteer their time to shape Chicago’s built environment and its future. Since its inception, the PBC has enhanced education, safety and recreation across Chicago by building or renovating hundreds of schools, city colleges, libraries, parks, fire houses, police stations and other facilities. Through such ambitious initiatives as Neighborhoods Alive 21 and Modern Schools Across Chicago, the PBC has built and continues to build new facilities that enhance every neighborhood of the City of Chicago and Cook County. PBC clients include the City of Chicago, Cook County, the Chicago Public Library, the Chicago Public Schools, the Chicago Park District and the City Colleges of Chicago. Beginning with land acquisition, the PBC’s professional staff manages each project through planning, financing, land acquisition, site preparation and remediation, design, construction and furnishing, functioning as a single point of responsibility for “turn key” development. The PBC’s first major construction project was the Chicago Civic Center, which continues to be its headquarters. Started in 1963 and opened in 1966, it was re-dedicated as the Richard J. Daley Center in 1976 to honor the late mayor shortly after his death. Heralded around the country as an architectural gem, the open, modern design of the Daley Center revolutionized government structures in Chicago and throughout the nation. 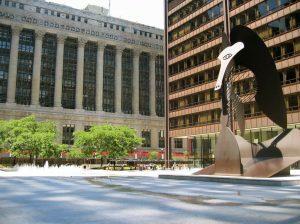 A year after the Civic Center was complete, the City of Chicago commissioned Pablo Picasso to create a steel sculpture to grace the facility’s grand plaza. This work of art helped establish the Daley Center as one of Chicago’s most important architectural landmarks and has become a distinctive symbol of the city itself.